In addition to ordering from me online, my Shrinking Bird Populations photobook is now available at the Montezuma National Wildlife Refuge visitor center, and the Iroquois National Wildlife Refuge visitor center. 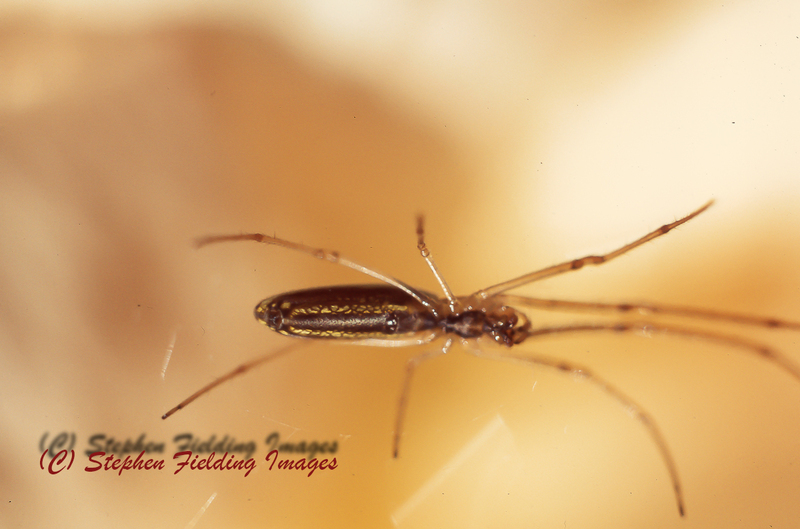 Starting in later April I will be bringing you photos of various insects from around the Northeast. Oooh! 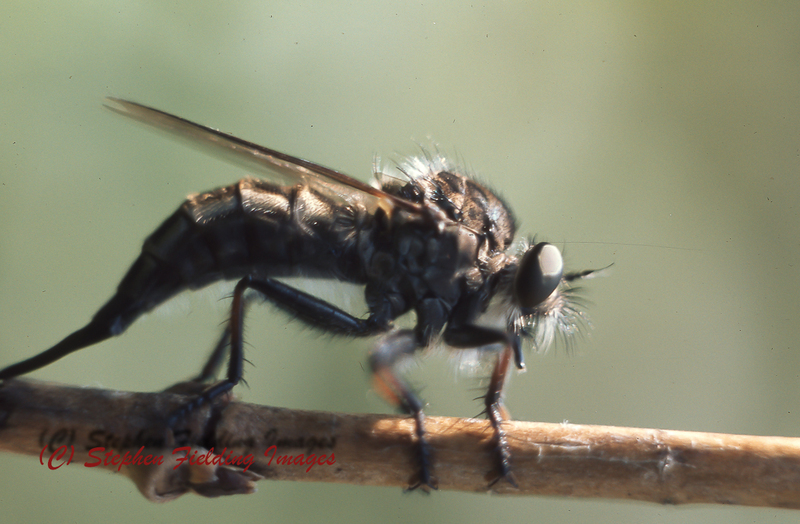 Insects you might wince, why insects? I know, we are not crazy about them. They look kind of scary, they bite us, and sometimes get into our food supply. What’s to like? The reality is they are part of our ecosystem. They provide food for birds, reptiles and others (and perhaps us in the future as we cut back on farm animals due to their intense use of resources, not to mention the methane flatulence of cattle). They are an important part of earth’s ecosystem. As I did several years ago with my bird photographs, I will give a brief description of each bug and whether it is on the endangered list. 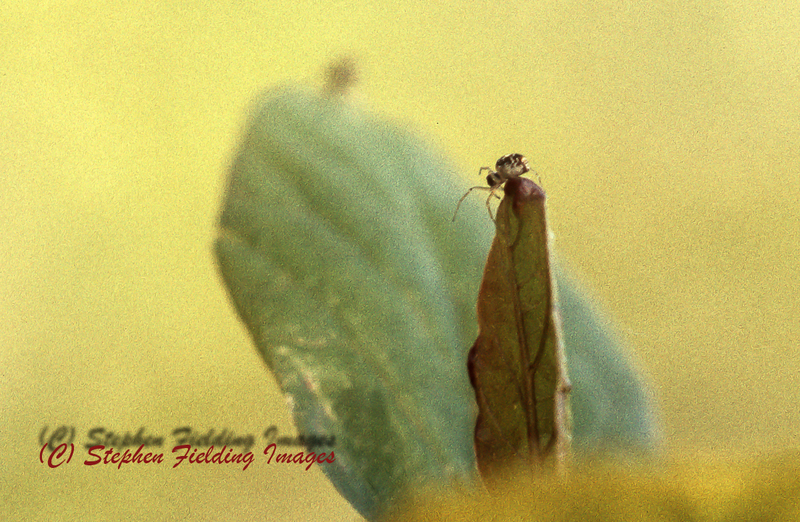 In the meantime here are a couple of photos to warm you up to these “cute” little creatures. I took these photos in the early 70s. I’ll be using my digital camera for the upcoming color photos so they will be much sharper. 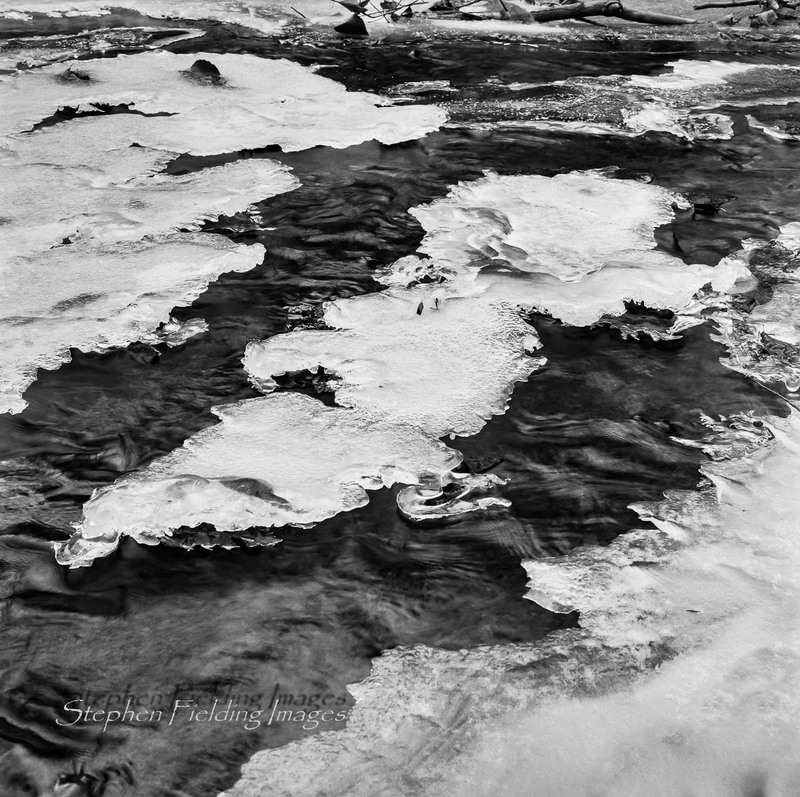 To get the finest grain and sharpest images I’m using Ilford’s Delta 100 and FP4 125 films. For those scenes with flowing water I use a 10 stop neutral density filter. This enables me to shoot using very small f stops, and shutter speeds ranging from 25 seconds to 21/2 minutes, rendering an ethereal look to the water. 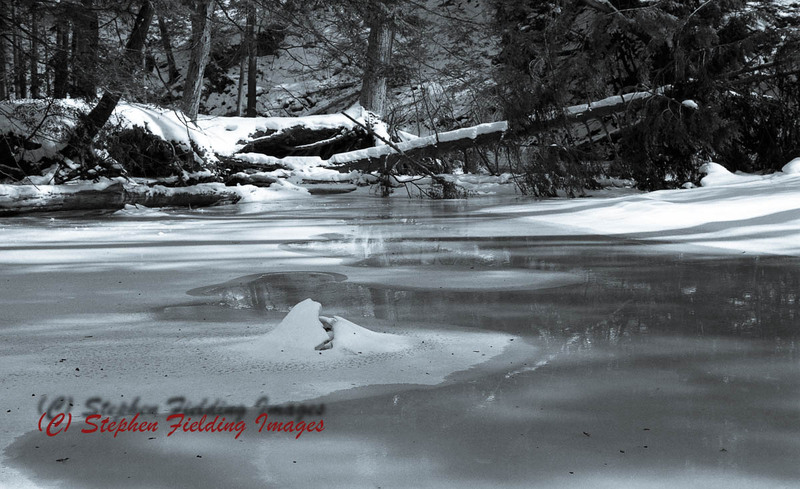 I lent a selenium cast to these shots to provide a cooler, more wintry look. 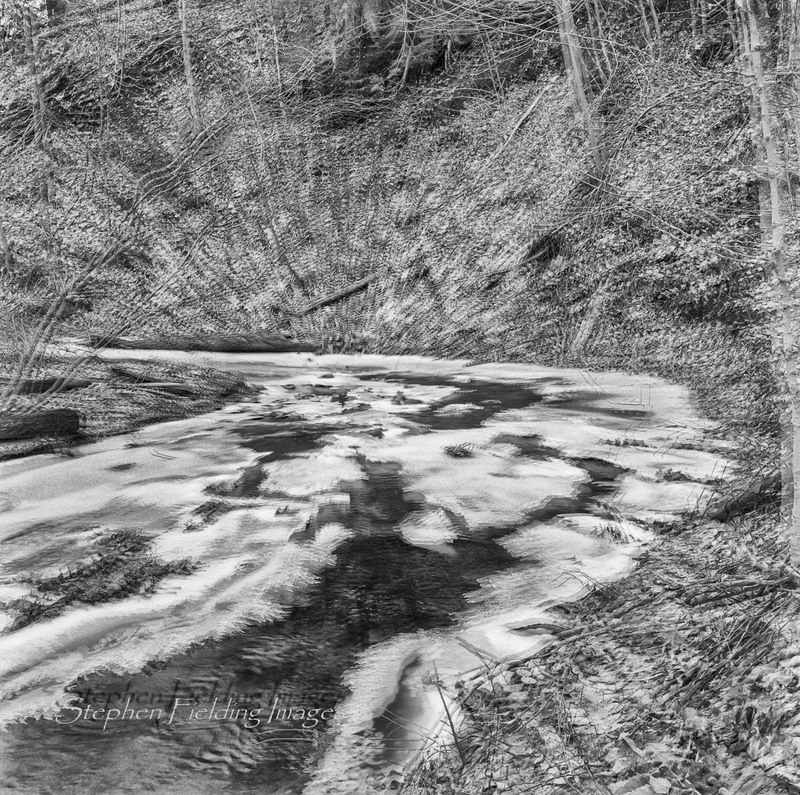 The stream flowed very slowly here so this was a more standard short exposure without a neutral density filter. You can see how different flowing water looks using a 25 second exposure. This shot was exposed for 2 1/2 minutes, rendering a soft, smooth look to the stream. I placed the camera on a tripod for all of these shots. I used both my medium format (120 film), and single-lens reflex (35mm film) cameras. The former’s images are in square format and located at my: on-line gallery. dampen vibration during shooting. I selected locations where I was at least partly shielded from wind with a good view of the pier. I took a total of 12 shots from three angles. 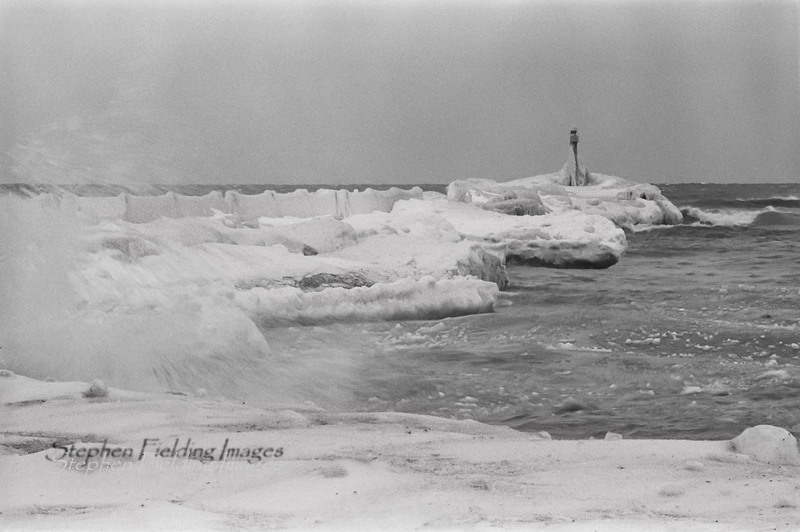 The first photo shows the pier completely under ice (taken slightly to the left of the pier). 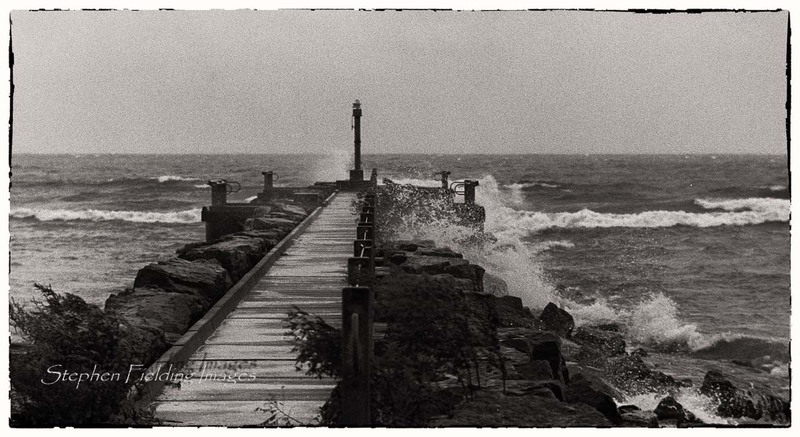 The second photo (taken slightly from the right) shows the same pier during a nor’easter last fall. 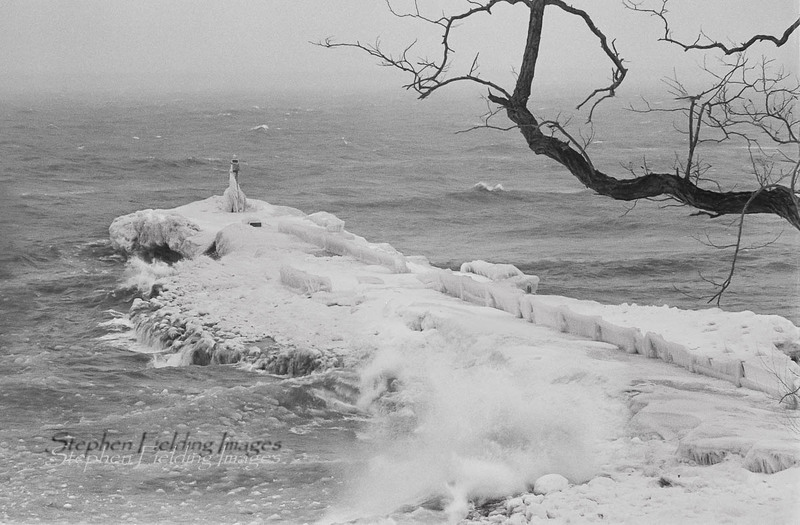 Fresh water freezes far more readily than salt water so it doesn’t take much cold to enable the waves to build high ice walls on the lake’s leeward shore lines. The trick is to wait for that split second when a large wave breaks. Had I been using my digital camera that can shoot 10 frames per second this would have been much easier. To get the third photo I walked a short way along the shore to the right of the pier looking for an opening free of branches. Resetting the tripod and camera while wearing gloves is always a challenge. This day I was wearing gloves with openings for the forefinger and thumb (and hand warmers in my pockets to rewarm them). I had to climb up the hill to get into place for the fourth photo. The wind was horrific. Fortunately, I was able to find a large tree close to where I needed to be to partially shield me and the camera. I took all these photos with my 35mm camera with a circular polarizing filter on a 135mm lens. 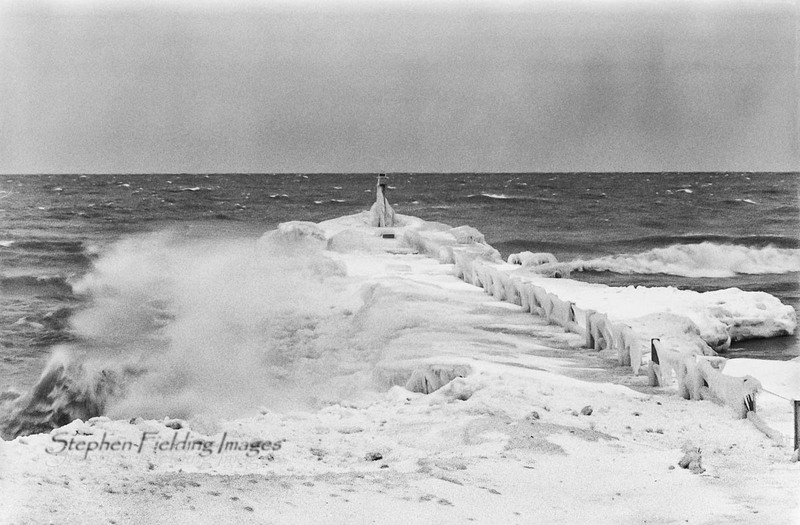 Since I was shooting Tri-X 400 film, the filter enabled me to shoot at slower shutter speeds to get a little blur on the breaking waves. Unlike shallow Lake Erie, Ontario is deep so it only freezes around the edges. While this works for surfers (yup, winter is the best time since that’s when the waves are the highest) we get lake effect (snow) all winter long when the wind is blowing on shore (i.e., off the lake). Those areas most exposed to on shore wind get the most snow. Watertown, at the east end of the lake gets the most, about 300+ inches per year! I do have a fascination with ice. It makes for a whole host of fine art abstractions. When water freezes its molecular structure changes at 32 degrees F to become a hexagonal crystal. I shot this series with my medium format camera on Ilford 120 film. This film has been around in a number of emulsions since about 1909; you might have used it in one of your Kodak Brownie cameras (that is, for those of you who go that far back). The negatives are 2 1/4 inches square, thus the square prints. I took all these photos using a tripod. 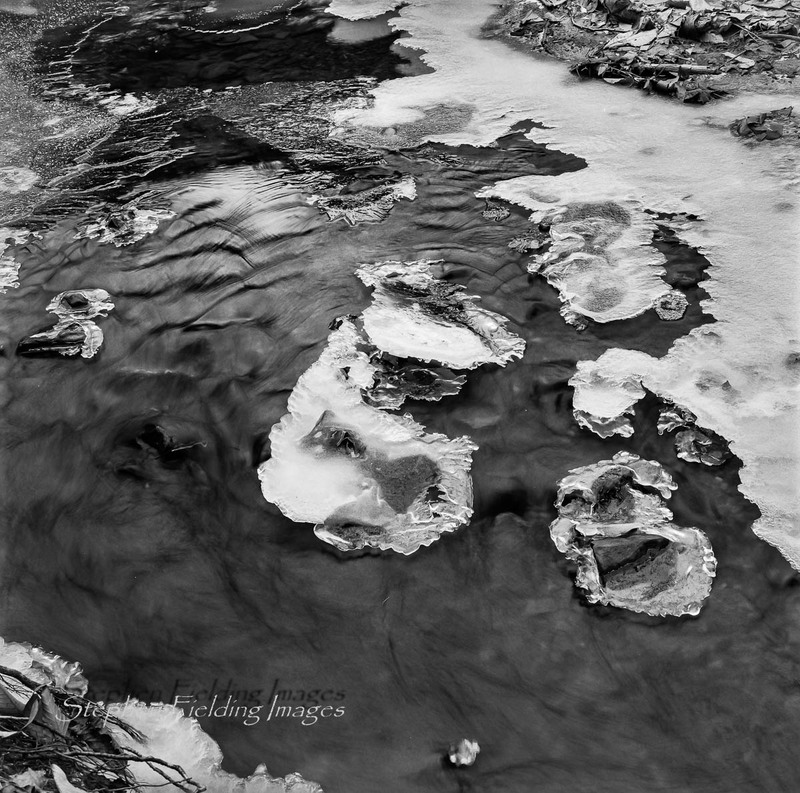 The most difficult aspect of photographing ice is that it tends to be cold outside, making it necessary to use gloves. These make it difficult to handle and operate the camera. So I use different weight gloves, sometimes with hand-warmers, depending on the temperature. The latter come in “handy” when the temperature falls to the twenties and below. I also wear multiple layers to keep warm, since I’m not generating as much heat as I would on a hike. This day I was wearing micro-cleats on my ankle-high hiking shoes so I could walk the icy trails with abandon. You might have heard of the silk road? Well I call this first shot Silk & Ice. 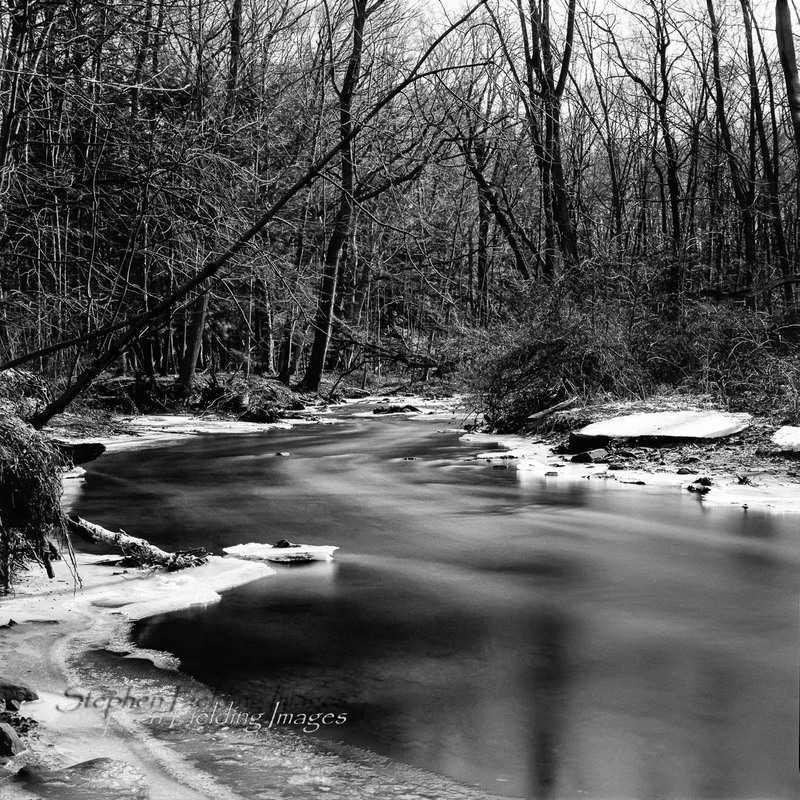 I just love how this stream curves through the woods, flanked by snow and ice. It’s all part of the world around us. I photographed this on a Sunday afternoon but no one was there, except for two fisherman. People, get off the couch! I went a bit “off the rails” in the next photo to capture Surrealistic Bend. I tapped the camera during the 1/4 second exposure. It’s kind of jolting; it really wakes you up! I have no doubt that this will command a high price on the open art market. If you stretch your imagination a bit (maybe a lot) you can see Great Britain, with France on the lower right and northeastern North America to the left (do you see Cape Cod?) in the next photo. Unfortunately, it appears that Ireland went under, something that’s likely to happen with the whole Brexit affair. To my way of viewing this last photo is more of an ink-blot test. It can really be anything that your psyche brings to consciousness. If it looks like dead rodents floating in the water, you probably need help (no, this didn’t come to my mind, I’m just sayin’). So that’s it for now, I’ll have a few more of these up on my online gallery in the near future. And just a reminder, everything in my gallery is available for sale. See my online store for details. I hope you find some interesting ice! A friend and I went to Taughannock Falls and Watkins Glen State Parks yesterday. It was a beautiful day with blue skies and somewhat brisk at eight degrees Farenheit. 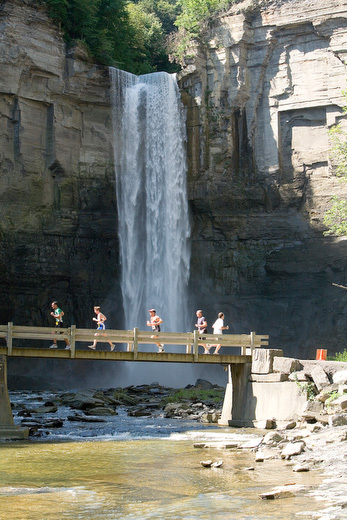 These parks are known for their deep gorges carved out by water, along with their waterfalls. 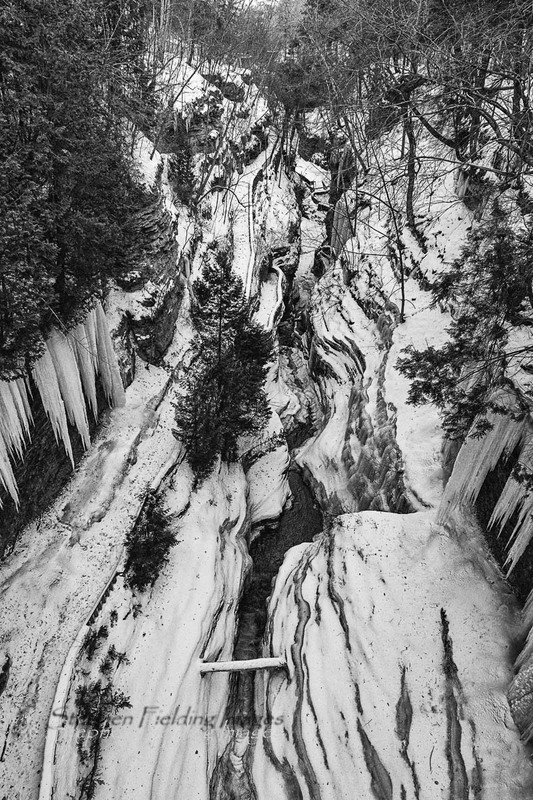 These gorges are paralleled with paths cut into the stone ledge, most of which were closed, due to ice. 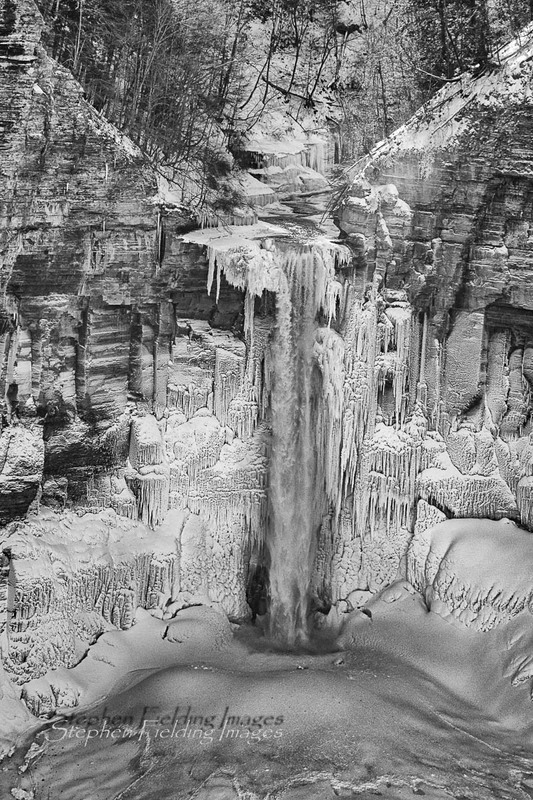 The first photo shows one of these falls where you can see the dramatic build-up of ice (followed by a summer view), including an ice dome at the base. We walked along a path overlooking the gorge where we found a relatively clear view of the gorge, showing the stream emptying into the southern end of Cayuga Lake, shown in the photo, below. 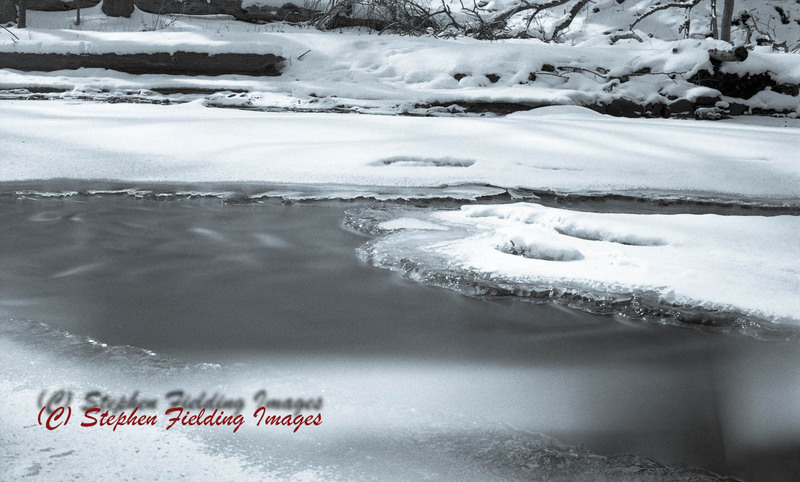 The photo on the right shows chunks of ice, covered with snow, illustrating that this shoot was all about ice. Since we could not get to most places in this park, we drove twenty miles to Watkins Glen to see if we would have any opportunities to walk along the gorge. Unfortunately, most were closed. However, the Gorge Trail was open where there were some overlooks and paths that were relatively safe (as I write this the following day, NY Parks closed this trail, due to poor conditions). Although there was bright sun, it was low in the sky so most of the gorge was shaded in the afternoon. I took the two following photos from one of the bridges crossing the gorge. I took the first with my lens set to 15mm and the second of the same scene set at 38mm. However, I changed how I processed the second photo to show a more abstract version. Intense cold and slippery surfaces make this type of photography a bit dangerous. Proper layered clothing and extreme caution near edges and ledges are critical for personal safety. 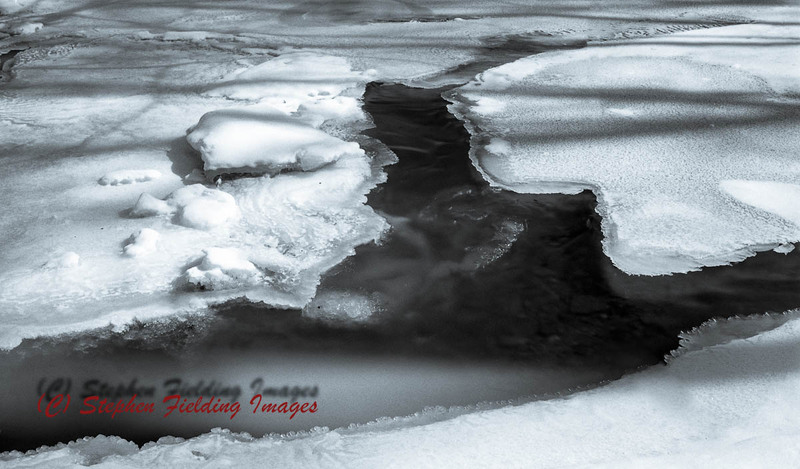 I will place a few more ice photos from this shoot in my on-line gallery in the near future. Since the 1980s computer model projections of climate change have underestimated this event. With greater advances in our understanding of the greenhouse’s effect on environmental change we have been able to make what scientists believe to be more accurate projections. However, recent radar studies of Antarctic ice mentioned in this New York Times article show there are likely more factors we are not aware of. In this case we learn that warming ocean waters have created a huge cavity beneath one of Antartica’s ice sheets. Since most of this sheet lies above the ocean, if and when it breaks off, it could raise sea-level by as much as two feet within a short period of time–threatening coastal cities and many islands across the world. As many environmental scientists have proposed, climate change might reach thresholds (i.e., tipping points) where unanticipated sudden catastrophic events might occur. It is counter intuitive but shorter, warmer winters bring intense cold snaps. These strain everything from railroad tracks to our energy bills. As we heat more, further CO2 is emitted, worsening the greenhouse effect. The weather around the finger lakes has been pretty mild so far, with temperatures mostly in the thirties and some forties with little precipitation. However, this might change with the anticipated coming of the polar vortex. One struck last year and produced three consecutive nor’easters along the east coast. 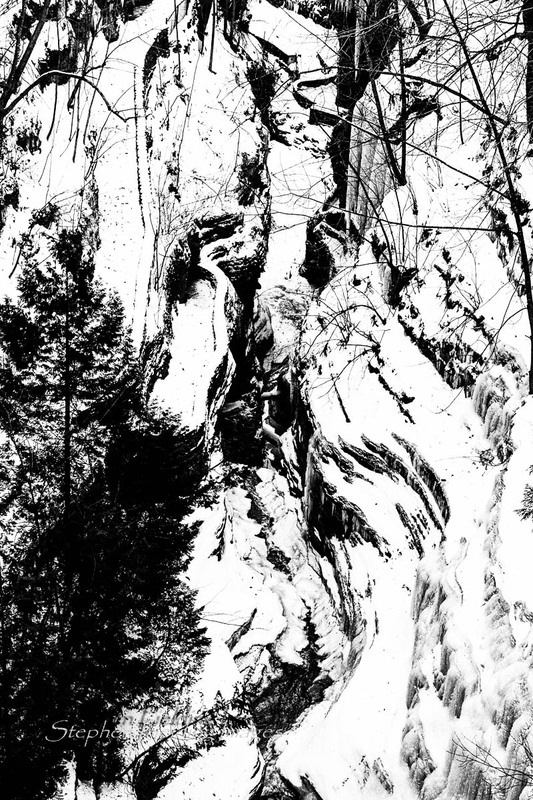 I traveled around the finger lakes in December where there were light patches of snow scattered about the countryside. Here are some of my highlight photos. Come celebrate this form of renewable energy. I’ll be showing fourteen of my photos taken earlier this year. 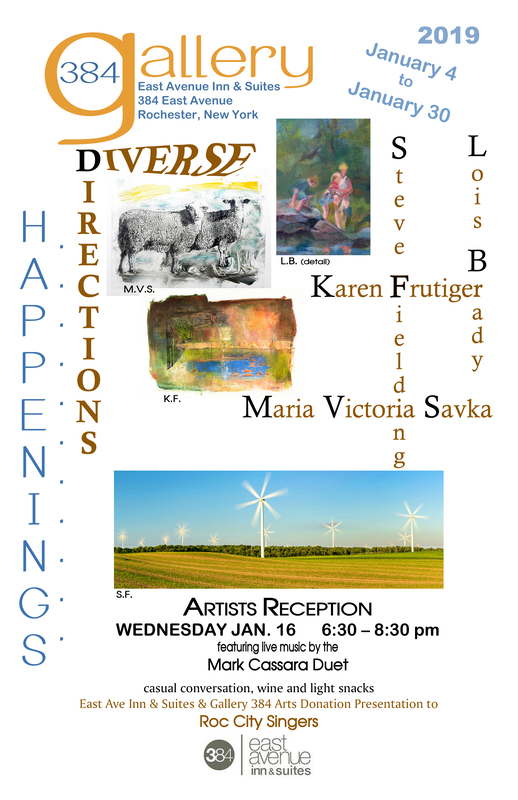 The exhibition runs from Jan 4 -30, with a reception on Jan 16. If you can’t make the reception, check with East Ave. Inn & Suites for their viewing hours. Unauthorized use and/or duplication of this material without express or written permission from this blog's author is strictly prohibited. Excerpts and links may be used, provided that full and clear credit is given to Stephen Fielding Images with appropriate and specific direction to the original content.